The official Web site for Sling Blade. Finally, after playing in Los Angeles, Chicago, and New York for several weeks, the rest of the country gets a chance to see Sling Blade, the acclaimed debut directorial effort from Billy Bob Thornton. 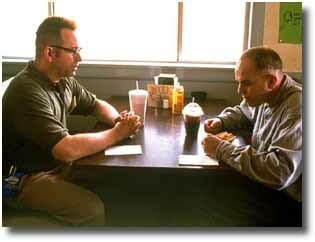 Earlier this week, Thornton received two Academy Award nominations for Sling Blade, one for his screenplay and the other for his lead performance. And in both roles, Thornton dearly deserved the nominations. It's hard to believe this Billy Bob Thornton is the same man who played a violent drug dealer in One False Move (which Thornton also wrote). His face and body language are completely different here. In One False Move (directed by Carl Franklin), Thornton played an abusive, loud, psychotic man, unshaven and forever on the verge of lashing out in extreme bursts of violence. But in Sling Blade, he plays a quiet, mildly-retarded man named Karl Childers, always freshly shaved and never moving much faster than a turtle. Karl has been confined to a state mental hospital for 25 years and now he is being released. "They turned me loose," Karl says. "Said I was well." When the state releases Karl, he returns to the town where he was born, where his parents confined him to a small shed with a dirt floor. But he doesn't know anyone now. When the bus drops him off, he just stands on the sidewalk, not sure what to do or where to go. One of the wonders of Sling Blade is how Thornton manages to take scenes that otherwise might be pathetic and make us laugh. It's a gentle brand of laughter that he evokes because we're not really laughing at Karl; instead, we're laughing at the crazy circumstances that put Karl out in the world again without really preparing him for what he'll find. Thornton also shows the absurdities at work in a world where practically everyone Karl meets talks about wanting to kill someone, where Karl easily outsmarts his "normal" coworker at an engine repair shop, and where Karl easily reads more books than most other people in the movie. 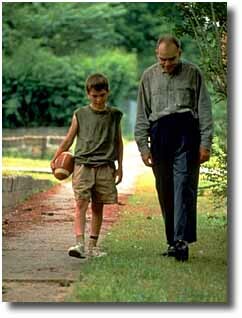 But the humor in Sling Blade is always met with an undercurrent of violence. In the movie's first few minutes, we learn about the murders that put Karl in the state hospital, and after he's asked by a reporter if he'll kill again, he says "I reckon I got no reason to kill no one." But the threat of that violence hangs over the movie, partly because we can't really read Karl. And what if he thought he did have a reason to kill? We sense that he is basically a good, moral man. But we also see the world around him erupting in violence. Would it be that difficult for Karl to believe that he might need to kill someone? Karl meets a boy (Lucas Black) and the boy's mother, Linda (Natalie Canerday), offers to let Karl sleep in their garage, but Karl soon finds out that the mother's boyfriend, Doyle (Dwight Yoakam), hates the boy and continuously threatens and belittles him. It's easy to see where the movie is headed, but that doesn't become a liability because all the characters are so carefully worked out. Yoakam is outstanding as the abusive boyfriend. Doyle invites friends over to the house and then bullies them and literally kicks them out. He tries to patch up his rocky relationship with Canerday by leaving work a little early: "I just thought I'd drop by and spread a little joy." But all the supporting performers are also excellent, especially John Ritter as the homosexual friend of Linda. He says goofy things like "I'm very in tune--maybe even psychic," but his performance never veers into caricature. Jim Jarmusch delivers a wonderfully funny performance as the Frostee Cream man who serves up the french fried taters that Karl loves. James Hampton plays the well-meaning but hopelessly bemused director of the mental hospital. J.T. Walsh gives an eerie and appropriately grating performance as a motor mouthed mental patient who delights in weaving lucid descriptions of kidnappings, rapes, and murders. And Robert Duvall makes a surprisingly brief appearance as Karl's daddy. 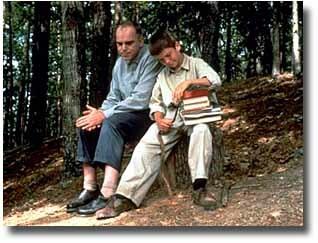 Sling Blade plays out like a Southern gothic tale in the tradition of Flannery O'Connor and William Faulkner, with a wonderful crop of supporting characters who seem eccentric and utterly believable at the same time. This is a marvelous, surprisingly funny movie with an absolutely great performance by Billy Bob Thornton.